A mentor once told me that only 1% of people have the skills and the vision to launch and build a global business, and only 1% of those people have the courage to actually do it. Startup life is grueling, thankless, and you are all but certain to fail. Coolhouse Labs attracted an amazingly talented, driven, diverse, and sometimes crazy group of founders. Working with them and supporting their dreams and vision was what we continue to work for everyday. It has been a ton of fun building this community over the past 3 years, and I'm excited to continue to watch our founders grow and build amazing things. TRNK was founded by two extremely talented entrepreneurs who earned their stripes working for iconic brands like Armani and JCrew, as well as e-commerce startups like Gilt. Until they ran into a problem while shopping for their home. There was no place online that they felt reflected the values and style that spoke to a new generation of consumers. So they set out to change the way we shop for our home, by combining content and commerce into one destination. TRNK is radically focused on curating high quality home goods that they know will look great in your home, while creating content that will help give their customers the context and confidence they need to make that investment. They have worked tirelessly over the last three years building their brand and customer base, and are starting to see the fruits of their hard work pay off with 30% month over month growth over the past year. We are excited to continue to help TRNK grow and take on the world of frilly pillows and floral prints. Project Travel is a platform that will power the next generation of educational travelers. They provide powerful tools for students to help find and apply to study abroad programs, and they've built a back end SaaS platform to help the International Education community find and attract students. Sam and Jen the founders of Project Travel are dynamic, hard working, and most importantly relentless. They know how to constantly move things forward. Their company has dramatically evolved since they started with us at Coolhouse Labs three years ago. Since then they have gone to crowdfunding platform on to build a SaaS product that will truly change their industry. They have gone on to raise two rounds of funding, build that product, and sign on customers across the globe. The idea behind Lorious was simple, on-demand video based consulting services on the internet. You could connect with an expert at any time to help you solve a problem. The problem they had - like many two-sided marketplaces - is that they couldn't convince consultants to come on board prior to demand for their services. However, this team will no doubt do great things in whatever they do in the future. An awesome concept with massive potential, however they couldn't get off the ground fast enough. Their goal was simple, lets combine every back yard garden into a community marketplace for locally grown food. Novi Times was a team that came to us all the way from Taiwan. They had built an AI powered news platform that suggested news streams for you to follow based on your interests, and updated you as new and relevant developments emerged. Novi launched with great success, but they couldn't find a way to build a user base beyond their initial app store growth. Fountain has set out to reimagine the way we send gifts and greetings. They are pushing the boundaries by creatively mixing old school practices with new school tech. With fountain you can easily send a hand written note or curated gift box to anyone in the world in just a few clicks. They are aggressively pursuing the B2B market with the goal of being the all in one destination for corporate gifting. Kunal and Tom are building their business old school and bootstrapping their way towards growth in 2016. JobHero is on a mission to help job seekers find the perfect job. No more spreadsheets, no more to do lists, and using email as your tracking system. 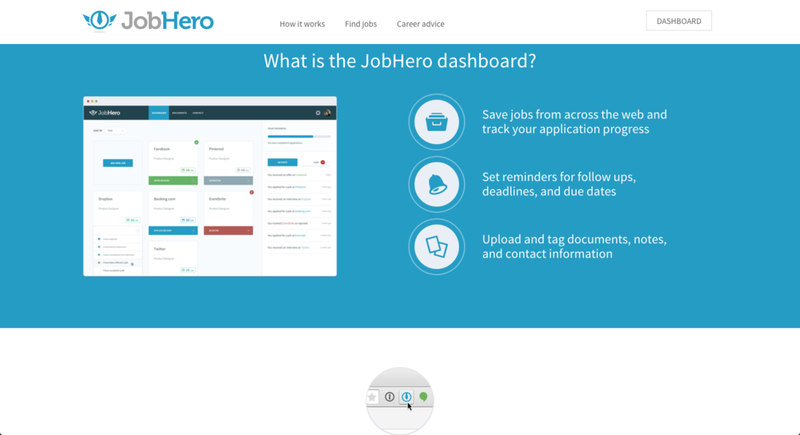 JobHero has built a dashboard that allows job seekers to search multiple job boards at the same time, empowers users to curate job postings from anywhere on the internet, and guides them through a carefully crafted process to go from job posting to job offer. They are primed for big things in 2016 with some big time strategic partnerships and new product offerings coming online. Rex is a Saas platform working with the giants of the global health industry to help bring animal health data into the 21st century. Rex has developed a suite of bioinformatics tools for the animal health and agriculture industries to predict, prevent, and precisely manage disease. They do this by aggregating istoric and realtime data across varied settings - from production lots, veterinary clinics, and other partners - to generate a comprehensive view of animal health on an individual and population scale. Pressed has a simple mission. To help people set at keep their goals. Currently in beta on iPhone, Pressed uses proven scientific methods to help people manage their time, set goals, and create lasting healthy habits. Alex and Rob set out to bring the sharing economy to that pile of outdoor gear sitting in the back of your closet. The idea was simple, outdoor gear is expensive and you rarely use it, so why don't you make some extra cash by renting it out. They also developed partnerships with gear makers to allow their users to demo gear before they buy it. They challenge was that they could not ramp up listings and orders fast enough given the cyclical nature of outdoor experiences. Rob and Alex are on to their next company KloudView - the Mint for businesses to manage their online services. LeaseMaid was a star of our 2014 program. They were building a platform to help rental managment companies better manage the leasing process. They raised a seed faster than any company we've ever worked with, and were weeks away from rolling out their full product suite when Founder and CEO Nate Kroll passed away suddenly. His loss was shocking for the Coolhouse community. His energy, passion, and drive were an inspiration to all of us, we miss him dearly. BlueMed was an automated patient intake system that collects patient demographics, patient history, insurance eligibility/benefits and vitals using sensors and branched questionnaires. They were raising a round on strong revenue numbers, when the Canadian government required them to return to Canada and finish their Medical training. Localfu was a creative platform that connected travelers with locals who would help them plan their trip to get the full local experience. The challenge was they could never demonstrate the value proposition to travelers to get them to change their behavior around how they planned their trips. Localfu was the brainchild of Roger Graham who has gone on to found two other companies including - Flip. Telling a story - whether it is for your business or personal - with video takes more than shooting great video, you need professional editing to help craft the story. The challenge, video editing is expensive and not accessible to most people. DreamItReel was built to solve this problem, by providing low cost video editing as a service for as low as $150. They've built a global network of distributed editors who are on call 24/7 to edit your raw video footage into a beautifully crafted video that is ready to share with the world. Since launched they've done everything to editing wedding videos to working with large corporates such as Getty and Yahoo! 50% of college students never graduate, and a leading indicator on whether or not student is likely to drop out is peer engagement in and outside of the classroom. The challenge for Universitys and Colleges is how do you identify students who are at risk of dropping out before it is too late? Fletch decided to tackle the problem by building an all in one mobile-first platform that gives students the ability to connect with each other in real time about their classwork. They can get quick answers to tough problems, share notes, and organize study groups. On the back end, Fletch is providing analytics to Universities on peer engagement. The mission is simple, give students the tools to connect with each other and give universities a platform to make sure they can get resources to students that need them to keep them enrolled. Nomsy is on a mission to build a community based platform that empowers customized food discovery centered around the way you live. This pintrest like platform was built to connect people around their specific lifestyles whether that is gluten-free, local, vegan (or all three). Nomsy’s platform sorts through social, restaurant, menu, recipe, and media data to help highly motivated and specific audiences find places to eat when they are out, and find recipes that match their lifestyle. If you want to build the largest and most powerful media company in the world from scratch, you would build a mobile video platform. Mobile video is the next frontier, and to some estimates is a $500 billion market in the US and Europe alone. Vervid has built a platform to do just that, specifically designed for how mobile users use their device — vertically. The mobile-first app allows anyone to easily shoot and edit content and discover engaging high-resolution fullscreen mobile video. Our media consumption is evolving and our phones are our first and primary screen. Vervid is on the cutting edge of that trend and are launced on iOS in July.